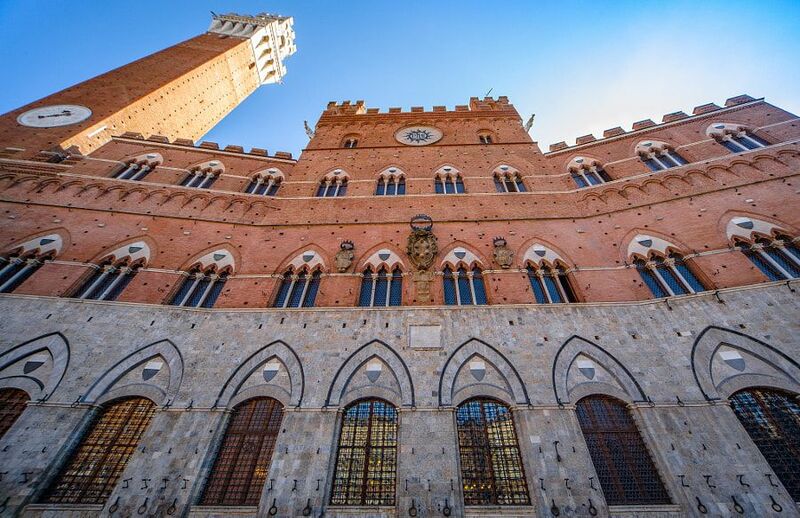 Palazzo Publico & Torre del Mangia – Siena - Together, We Make Memories! The outside of the structure is an example of Italian medieval architecture with Gothic influences. The lower story is stone; the upper crenelatted stories are made of brick. The facade of the palace is curved slightly inwards (concave) to reflect the outwards curve (convex) of the Piazza del Campo, Siena’s central square of which the Palace is the focal point. The campanile or bell tower, Torre del Mangia, was built between 1325 and 1344. This fine art image by Pat Kofahl is available in multiple sizes on paper, canvas, metal and plexiglass. Prices start at $49.00!